Like heartburn and leg cramps, bleeding gums in pregnancy is a common malady that expecting moms sometimes have to face. Bleeding gums are a completely normal condition with pregnancy. You can expect to see this develop anytime during the second month through to delivery day, with some women experiencing more bleeding than others. Gum inflammation is also known as pregnancy gingivitis, but it can be kept to a minimum with gentle oral hygiene. As with most of the changes your body experiences during pregnancy, hormones are largely to blame. The increase in progesterone during pregnancy makes it harder for the body to fight plaque bacteria in the mouth, making plaque more of an issue than usual. Additionally, a 30 to 50 percent increase in blood supply makes bleeding gums much more prominent because gums are swollen. About 50 percent of women experience bleeding gums in pregnancy, so it is a fairly common occurrence. Rinse with a salt water mixture of one teaspoon salt in one cup of warm water. Floss daily, using a gentle touch. It is still imperative to keep the mouth clean and remove any remnants of food. Use a soft bristled toothbrush, being careful not to aggravate gums. Brush gently twice a day, being careful not to apply unnecessary pressure with the toothbrush. Try using a fluoride toothpaste for sensitive teeth. Visit the dentist during your pregnancy for a routine check up and cleaning. He or she may recommend that you return for additional attention during pregnancy. Apply ice to sore gums to reduce swelling. Ice can sooth inflammation and ease the pain. Eat a balanced, healthy diet, avoiding sugary snacks. If you are suffering from morning sickness, brush and rinse if you have vomited. The stomach acid can cause additional sensitivity if it is not cleaned from the mouth. 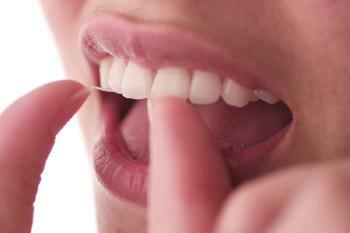 Never skip brushing or flossing, even if they cause mouth irritation or bleeding. It's still important to maintain good dental hygiene during pregnancy because poor dental care could lead to periodontitis and gingivitis. Periodontitis is a gum disease that can turn into an infection of bone and tissue in the mouth. Dental health is an important part of a healthy pregnancy, as gum disease and gingivitis have been known to cause premature delivery or preeclampsia. In rare cases, pregnant women may develop "pregnancy tumors," sores which occur when gum tissue grows or swells due to excess plaque. The size of the tumors vary, with some reaching up to three-quarters of an inch. If you develop this kind of growth, contact your dentist. These tumors may be painful, and if the tumor ruptures, you could develop an infection. If you find that the bleeding is frequent and excessive, make an appointment with the dentist to have an exam. Your dentist may want to do more frequent cleanings to keep tartar at bay during your pregnancy. In the case of periodontitis, your dentist or periodontist can safely remove plaque and tartar while you are pregnant. It is perfectly safe to have a dental cleaning when you are pregnant. but X-rays should be skipped until after delivery. If bleeding gums have been causing you discomfort or concern, be assured that the problem will diminish and go away once you give birth to your baby. Just realize that bleeding gums in pregnancy are a normal, albeit bothersome, part of carrying a child. With the helpful tips listed above and gentle dental care, you can minimize the extent of bleeding and tender gums.